While this is technically not a picture of an animal eating an animal, it's of an animal trying to eat an animal - an organgutan trying to catch a fish using a spear of some kind. Apparently this image was taken in Borneo. 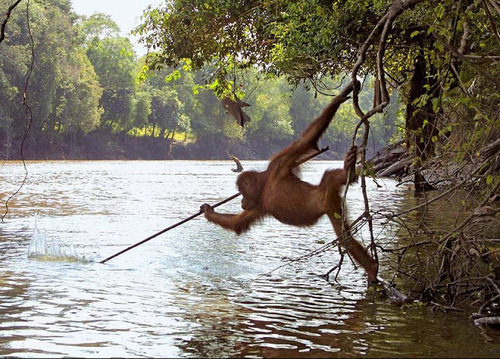 Apparently this orangutan had some dudes spear fishing on the river and mimicked them. Word on the street is this clever orange fellow didn't have any luck, but I'm sure you'll agree it's a pretty cool picture.